10-piece set. Similar to DIN 338. Ø 0.3 - 0.5 - 0.8 - 1 - 1.2 - 1.5 - 2 - 2.5 - 3 - 3.2mm. 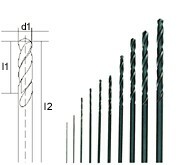 For drilling non-ferrous metal, steel and stainless steel. In labelled cassette with fold back and stand function. For clamping we recommend our3-jaw drill chuck.